An entrepreneur and former CEO of a middle market aerospace company wished to pursue a business plan focused on manufacturing electronic components, a market niche where M&A Capital had past experience.The CEO approached M&A Capital to both assist in developing the operating strategy and raise capital to execute the plan. The operating strategy included making acquisitions in a niche market in the aerospace industry, which required identification of a strong financial partner to enhance the new venture's credibility as a buyer. During the initial months of M&A Capital's engagement, we assisted the CEO in identifying potential capital providers that had an interest in providing acquisition and growth capital to this niche market. 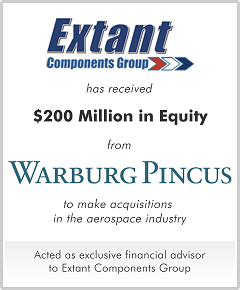 The entrepreneur elected to partner with Warburg Pincus to create Extant Components Group due to the firm's experience and deep relationships in the aerospace industry, and ability to act as a value-added partner to build the business. Warburg Pincus agreed to provide a significant line of equity from Warburg Pincus Private Equity X, L.P., a $15 billion fund, to support the Company in its acquisition strategy and long-term growth plans. 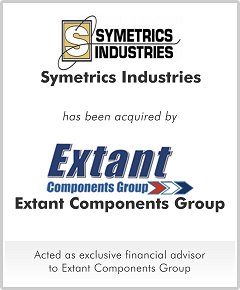 Shortly thereafter, the Company closed on its first platform acquisition, Symetrics Industries.